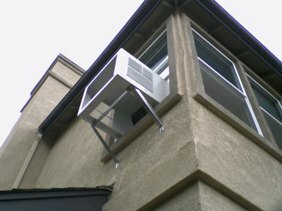 This installation was a large air conditioner to be installed in a second story window. A little extra time was spent in fashioning a support bracket because the bracket included with the air conditioner was very flimsy. This was not a do-it-yourself job for the homeowner because of the height involved. Electricity was available for the air conditioning unit very near to the base of the window. Cost to install air conditioner in wall. Unit is 26.5 by 18.5. no wires in way no plumbing in way power already there. vinyl siding. Picture frame in side with case molding no sill. thank you. Need a handyman to install a small window air conditioner. I need an estimation how much he would charge. Of course I am not willing to pay more worth than the price of my AC. Here in Hawaii I quoted a customer $125.00 and the said that was to steep. Some consumers don’t know what it takes at times to install window A-C Units. $125 is probably a good and fair price to install a window air conditioner. The cost would be higher if electricity is not available near the window. The style of window will also affect the installation cost. $100, because the AC cost $225 at Lowes. unfortunately, i’ve done this for free out of the kindness of my heart thinking i’d snag a $50 tip. i work full time as a handyman and super, but ill never again not price a job. $125 is fair, considering what you may or may not be dealing with. I have a winow ac 14,000 btu which I need to have installed in a sliding window . The size of the window is the right size to handle this job. Estimate to install a window ac in an old house.